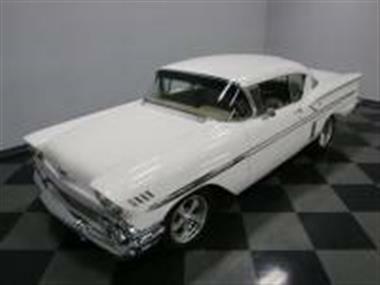 1958 Chevrolet Impala in La Vergne, TN for sale. 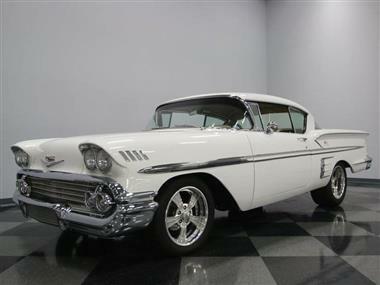 Owning a 1958 Chevrolet Impala coupe is already a mark of distinction. But when yours has been restored to the highest standard where the exterior is radiating shineand#44; the interior is as comfortable as a Lexusand#44; and the 502ci performance motor with five-speed transmission humble plenty of other street machines... well thenand#44; you know youre looking at a one-of-a-kind restomod classic.<br /> <br><br> The 58 Impala looks terrific in white: formaland#44; imposingand#44; and emphasizing the dramatic one-year-only styling. 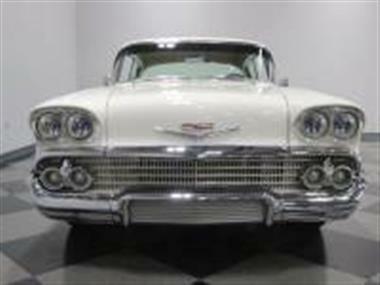 During the buildand#44; they were aiming to create the ultimate 58 with a high quality finish all aroundand#44; so the doors fit extremely welland#44; the gaps are evenand#44; and all that glittering trim was painstakingly aligned to give it the look the designers dreamed of in 58. The mirror-like shine of the modern clearcoated white was given the kind of luster that makes this coupe look like it was made out of porcelain. 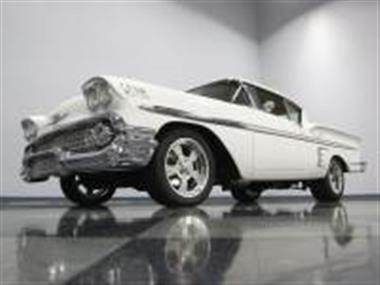 Against this amazing paintand#44; you can bet a small fortune was spent making sure that bumpers shined like mirrorsand#44; the grill had a 10and#44;000-watt smileand#44; and the trim remains an unbroken line as it artfully runs down the profile and merges with the extra long tailfins. 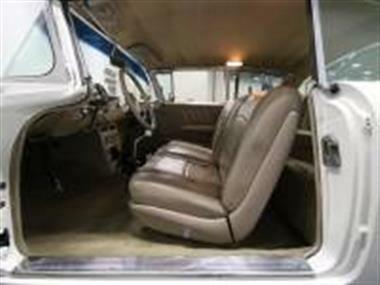 But this is much more than just a solid execution of an American classicand#44; and the large 17-inch alloys are your first clue.<br /> <br><br> From the moment you open the doorand#44; you can easily tell there was a ton invested in creating a completely custom two-tone tan leather interior. The seats have the kind of comfort that put some modern luxury machines to shame (there was even Dynamat laid down for superior sound and weather insulation.) And you get plenty of modern comfort for you and your passengers with features like the AM/FM/CD stereo that has a powered subwoofer speaker system and aux input for modern music players. Plusand#44; theres R134a air conditioning to keep you looking cool even while showing off the cool pillarless hardtop profile. But your best treats become most apparent when you slip behind the Billet Specialties custom steering wheel. From there you get a commanding view of the custom dash. 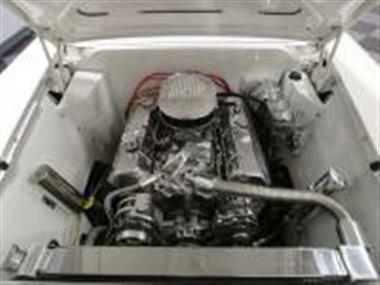 Plusand#44; the large AutoMeter tach goes perfectly with the Hurst shifter.<br /> <br><br> While the exterior and interior have a few performance cuesand#44; this coupes full beastly nature can no longer be hidden the moment you pop the hood. 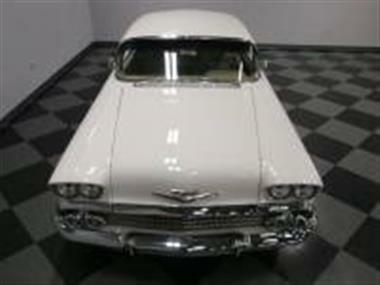 Within those smooth white inner walls is a shimmering big block package (seriouslyand#44; we dare you to find another component that can be polished to a show-worthy shine!) But when you look beyond the styleand#44; youll see the serious substance of a Chevy ZZ502 crate motor. This monstrous performance V8 is rated right out of the box to make as much power as its displacement (yes 502 hp!) It includes great components like a hydraulic roller camand#44; forged pistonsand#44; aluminum headsand#44; Holley 850 CFM four-barrel carburetorand#44; and so much more. It connects to a Borla three-inch dual exhaust systemand#44; but if you really want to scare off the lesser carsand#44; all you need to do is open the Pypes electric cutouts. You are in complete control of this thumpin V8 thanks to the Tremec five-speed manual transmission with Lakewood blowproof bellhousing. This feeds the stout Ford 9-inch rear end with a limited slip and Moser 31 spline axles. Making sure the rubber stays planted to the road is an adjustable triangulated ladder bar setup and a mini tubbed rear end to accept wider rubber. More than just pure performance in a vintage packageand#44; features like power steering and four-wheel disc brakes ensure this is an all-around great driver.<br /> <br><br> Complete with plenty of build receiptsand#44; maintenance recordsand#44; and restoration photosand#44; youre looking at everything you want in a 58 Impala and so much more. But theres only one of these very unique coupes up for grabsand#44; so hurry and call today! 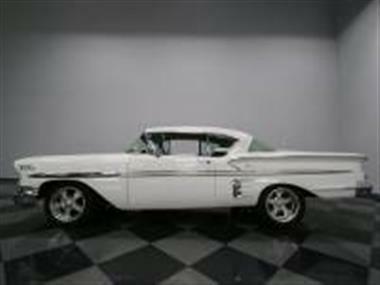 This vehicle is priced $16,498 more than the Average Market Price of $63,497 for a 1958 Chevrolet Impala. This is a Poor Deal as it's priced 21.0 % above market avg. The Pie chart below shows the number of ads within different price ranges.